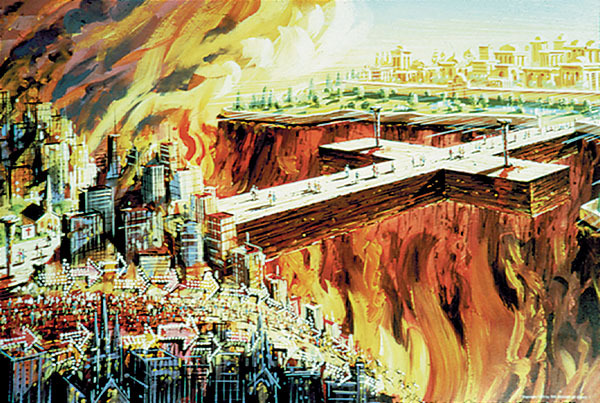 The theory or model of atonement that was popular for much of the first thousand years in Christian history emphasizes the titanic struggles between God and Satan for the fate of humanity, a struggle that culminates in God’s triumph through the cross and resurrection of Jesus. What do you find comforting—or uncomfortable—about the idea that the cross is too big for any one theory or model of atonement to explain? What might be helpful about knowing and understanding several different theories of atonement? When have you experienced “atonement”—that is, the healing or restoration of a relationship that was broken? How might recalling these experiences help you approach our discussions of the cross? Think about a time in your life when you felt as if the whole world was conspiring against you or when you or a loved one felt captive to something or someone else—perhaps a bad habit, a pessimistic outlook, a pattern of destructive behavior, or something more difficult. How might this theory about God entering into our struggle, determined to win us back to health and life, help you during a time like that? 1After Jesus had spoken these words, he went out with his disciples across the Kidron valley to a place where there was a garden, which he and his disciples entered. 2 Now Judas, who betrayed him, also knew the place, because Jesus often met there with his disciples. 3 So Judas brought a detachment of soldiers together with police from the chief priests and the Pharisees, and they came there with lanterns and torches and weapons. 4 Then Jesus, knowing all that was to happen to him, came forward and asked them, ‘For whom are you looking?’ 5 They answered, ‘Jesus of Nazareth.’ Jesus replied, ‘I am he.’ Judas, who betrayed him, was standing with them. 6 When Jesus said to them, ‘I am he’, they stepped back and fell to the ground. 7 Again he asked them, ‘For whom are you looking?’ And they said, ‘Jesus of Nazareth.’ 8 Jesus answered, ‘I told you that I am he. So if you are looking for me, let these men go.’9 This was to fulfill the word that he had spoken, ‘I did not lose a single one of those whom you gave me.’ 10 Then Simon Peter, who had a sword, drew it, struck the high priest’s slave, and cut off his right ear. The slave’s name was Malchus. 11 Jesus said to Peter, ‘Put your sword back into its sheath. Am I not to drink the cup that the Father has given me?’ 16 Then he handed him over to them to be crucified. Meanwhile, standing near the cross of Jesus were his mother, and his mother’s sister, Mary the wife of Clopas, and Mary Magdalene. 26 When Jesus saw his mother and the disciple whom he loved standing beside her, he said to his mother, ‘Woman, here is your son.’ 27 Then he said to the disciple, ‘Here is your mother.’ And from that hour the disciple took her into his own home. 28 After this, when Jesus knew that all was now finished, he said (in order to fulfill the scripture), ‘I am thirsty.’ 29 A jar full of sour wine was standing there. So they put a sponge full of the wine on a branch of hyssop and held it to his mouth. 30 When Jesus had received the wine, he said, ‘It is finished.’ Then he bowed his head and gave up his spirit. What words would you use to describe Jesus, as portrayed by John? How does that portrayal match or connect with your own understanding of Jesus? What is similar? What is different? What is comforting, helpful, or inspiring about John’s portrayal? What is troubling or confusing? In your life when would this picture of Jesus have been most helpful?